A prophet proclaimed, `When I found your words I devoured them; they became my joy and the happiness of my heart' (Jeremiah 15:16). What a wonderful gift the Little Rock Catholic Study Bible is for the People of God, especially those who hunger for God but are puzzled or intimidated by God's Word. Clear background information, explanations, and charts throughout its pages help make the Word of God palatable for modern readers. In addition, pictures of the holy sites, like seasoning, make Scripture more appealing; and prayer starters encourage savoring it. By feasting at the table of the Word as presented in this study Bible, readers will be drawn to Jesus, who is the ultimate Word and source of eternal joy. As a coordinator of the Los Angeles Archdiocese Catholic Biblical Institute, I am always searching for resources that will enhance the lectures and required reading of our students. 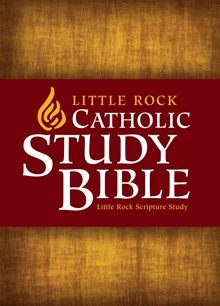 The Little Rock Catholic Study Bible lives up to its claim as an `all-in-one-resource.' Significant church documents on the Bible, as well as the church's use of the Bible in liturgy and social justice, help guide the reader to a Catholic approach to reading Scripture. Introductory notes on each book of the Bible, indexes, extensive footnotes, cross references, clarification of difficult terms and ideas, color maps, time-lines, charts and photographs, together with prayer starters, provide everything necessary for a successful encounter with God's Word. I received a copy of Little Rock Catholic Study Bible as a gift from Sr. Irene Nowell. Until I started working with it, I didn't even realize I needed a new Bible! It is magnificent, a true labor of scholarship and love. Every page draws one more deeply into the text, its history and its meaning. Abbot Gregory J. Polan, O.S.B., Conception Abbey/Conception Seminary College; Editor, The Revised Grail Psalms. This study edition of the New American Bible is intended to help readers uncover the layers of meaning in a given book or passage of Scripture so that the words on the page may come to life.